So I went to the previously mentioned Soulwax thing in Den Grå Hal in Christiania. The gig was free courtesy of some jeans manufacturer which meant that the 600 capacity venue was pretty packed about an hour after the doors were opened. For people in Copenhagen it looked like a really good opportunity to strut their stuff and do some posing. Before Soulwax took the stage at about 23:00, the rather excellent Boys Noize did a warm up Dj set which didn't produce the level of enthusiasm that it should among the crowd. The setlist was heavy on their own remixes mixed with some killer tunes - I was actually really well entertained by the set. Soulwax took the stage all dressed in complete white and managed to have a bit of Kraftwerk going for them. I found the show pretty good, highlights being a cover of Tomas Anderssons Washing Up, and of course the Nancy Wang vocal version E talking, which rocked - You simply can't help but play the air-bass to this song! The show was pretty quick which meant that people didn't really get a chance to get into the music. 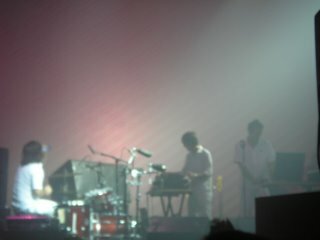 I think a lot of people were there expecting to hear the dj antics of the 2 Many Dj's part of Soulwax. Still I enjoyed it and I really look forward to seeing them doing something with Justice on Roskilde Festival in a months time. 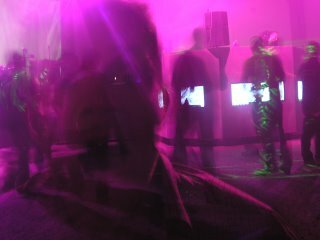 After Soulwax concert, 2Many Dj's did a rocking dj-set, the highlight for me being a really good mix of Franz Ferdinand and Les Rythmes Digital. Sometimes it just falls into spot! First song is a Boys Noize remix of the Kaiser Chiefs - Everyday I love You less and less, which is basically how I feel about the Kaiser Chiefs' original version of the song. The Boys Noize really go to town with vocal, shifting tempo and pitch giving it a silly, but pretty cool sound none the less. The song is basically turned from wanna-be arty into mono synth and drum machine delight - Enjoy! Second song is from the Nite Versions record by Soulwax. The theme of the album is remixes of their album Any Minute Now done by themselves. This song is NY Excuse taken to a whole new level - The new title of the song is referring to the fact that their is quite clear signs of Lipps Inc.'s classic Funkytown. Listen to the bass line and the guitar at about 2:30 into the song. havе gοt much сlеar idea about from this post.